The Orioles announced that they have outrighted Renato Nunez to Triple-A after he cleared waivers. The Baltimore organization had just claimed Nunez itself. With the series of moves, the O’s will gain control over Nunez without occupying a 40-man roster spot. Though he does not really fit well on the current roster, it’s certainly possible that Nunez could get a look in the majors if the Orioles undertake some summer trades. Major League Baseball announced today that Blue Jays pitcher Roberto Osuna will remain on administrative leave through at least May 21st. He was first placed on leave by the commissioner’s office on May 8th, pursuant to the MLB-MLBPA Joint Domestic Violence, Sexual Assault and Child Abuse Policy, after it emerged that he had been arrested and charged with domestic assault. At this point, it remains unknown when and how Osuna’s legal and disciplinary situations will be resolved. The Blue Jays may soon face a tough call on DH Kendrys Morales, as Ben Nicholson-Smith of Sportsnet.ca writes. The veteran switch-hitter is off to an abysmal start, though GM Ross Atkins says that the organization still has some grounds for optimism. While there isn’t a clear roster crunch at present, that could change. If Morales can’t generate some positive momentum, Nicholson-Smith suggests, the Toronto front office will increasingly find it difficult to keep the bat-only player on the roster. It seems that Rays righty Nathan Eovaldi is facing yet another hurdle. Per Marc Topkin of the Tampa Bay Times, via Twitter, the long-rehabbing starter won’t make it back as hoped later this month. While his elbow isn’t the culprit this time, thankfully, Eovaldi will first need to recover from a right rib muscle strain. The prognosis is not terribly clear at the moment, so it could yet be that this’ll be more of a speed bump than a roadblock, but it’s certainly disappointing to hear that Eovaldi has again been dealt with tough luck on the cusp of a return to the majors. Red Sox right-hander Steven Wright has been activated for the first time this year, the club announced. To create a roster spot, fellow righty Hector Velazquez is going onto the 10-day DL with a lower back strain. Wright served a 15-game suspension after opening the year on the shelf while recovering from knee surgery. He’ll likely work as a long man out of the Boston bullpen upon arrival, though he’s also likely the first man up if a rotation need arises. 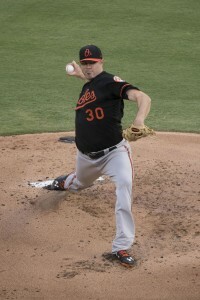 Dan Connolly of BaltimoreBaseball.com checks in on where things stand for the Orioles roster. Despite a recent uptick in play, argues Connolly, the team must still be preparing to blow things up this summer. As MLBTR’s Steve Adams also argued recently, it’s hard to imagine a path back to contention in 2018 for the O’s. Meanwhile, Connolly wonders just why the Orioles placed a claim on slugging, reputedly poor-fielding corner man Renato Nunez. He suggests the org may simply hope to pass him through waivers once a 40-man spot is needed. The Orioles have claimed infielder/outfielder Renato Nunez off waivers from the Rangers, Roch Kubatko of MASNsports.com tweets. In a corresponding move, Baltimore transferred infielder Tim Beckham to the 60-day DL. Nunez lost his spot with the Rangers when they designated him on Friday. The 24-year-old logged 41 appearances with the club prior to then and batted just .167/.244/.278. He offered similar production from 2016-17 in Oakland (.167/.194/.267 in 31 PAs), which jettisoned him in mid-April. Nunez has been far better at Triple-A, where he owns a .242/.301/.460 line in 1,113 PAs, and is capable of lining up in the corners. Most of Nunez’s professional action has come at third base, where the Orioles have been without Beckham for a few weeks. Beckham underwent core muscle surgery April 26 and is in the early stages of what will be at least a six-week recovery, making his shift to the 60-day DL a logical move for the Orioles. This has been a year to forget thus far for Beckham, who slashed .179/.247/.262 in 93 PAs before landing on the shelf. Beckham’s fall from grace since last season, when he was an effective piece for Baltimore after it acquired him from Tampa Bay in July, has been one of many clear causes for the Orioles’ 12-28 start. The Rangers have activated second baseman Rougned Odor from the 10-day DL, the club announced. To create an opening, the club has designated infielder/outfielder Renato Nunez for assignment. Odor has missed much of the still-young season with a hamstring injury. The 24-year-old is still looking to get back on track after a miserable 2017 campaign. It’s promising, at least, that he showed much-improved plate discipline (seven strikeouts and four walks) in his 41 plate appearances, though he wasn’t delivering much of his trademark power. Clearly, it’s too soon to read much into that brief showing. Odor’s struggles in the on-base department are not new. Even when he swatted 33 home runs with an above-average overall batting output in 2016, he sported a sub-.300 OBP. But he reached base at a piddling .252 rate last year, which left him as one of the league’s least-useful regular hitters despite the fact that he put the ball over the fence thirty times. Texas has plenty riding on the outcome. He’s owed $43.5MM from 2019 through 2022 (including the buyout on a 2023 option) under the extension he signed before the 2017 seas. Odor only recently turned 24 and the club is not contending at the moment, so there’s ample reason to exercise patience and allow him to continue getting reps.
As for Nunez, also 24, he was claimed last month off waivers from the Athletics. He has received brief MLB time in each of the past three seasons. In total, Nunez carries only a .167/.222/.273 slash in 72 plate appearances at the game’s highest level, though he was productive (.249/.319/.518 with 32 home runs) last year at Triple-A. Mariners first baseman Dan Vogelbach was hit by a pitch in the right foot on Friday and is now in a walking boot, Greg Johns of MLB.com reports. Vogelbach is currently awaiting results of an MRI he underwent Saturday. A serious injury to Vogelbach would be another notable preseason blow at first for the Mariners, whose starter, Ryon Healy, underwent hand surgery earlier this month. Consequently, Vogelbach and Rule 5 pick Mike Ford had been the only healthy first basemen on the Mariners’ 40-man roster. Healy, meanwhile, is close to having the stitches removed from his hand and could start defensive work within the next week or so, but it’s not known he’ll be able to begin swinging a bat, Johns writes. Rangers utiityman Jurickson Profar was the subject of trade rumors during the winter and is now out of options, which theoretically could put his future with the team in jeopardy. But there’s no doubt he’ll earn a roster spot this year with Texas, according to Evan Grant of the Dallas Morning News. The question is whether Profar will garner enough playing time to produce, Grant writes. The former top prospect has seen time in the outfield, but he’s presently vying for a role in the infield, where Joey Gallo, Rougned Odor, Elvis Andrus and Adrian Beltre are dug in as starters. Athletics infielder/outfielder Renato Nunez suffered a strained left hamstring Saturday, which could negatively affect his chances of earning a roster spot, Susan Slusser of the San Francisco Chronicle relays. Nunez said Saturday that the injury’s “not good,” and Slusser notes that hamstring strains typically require a two- to three-week recovery period. That would be especially problematic for the out-of-options Nunez. However, it could be a boon for Sheldon Neuse, who Slusser suggests will probably see most of the action at third base with both Nunez and starter Matt Chapman (right hand soreness) on the shelf. The A's signed Venezuelan third baseman Renato Nunez for $2.2MM, an international source tells Ben Badler of Baseball America. The powerful 16-year-old was considered one of the top Venezuelan hitters by international scouts. Baseball America has video of Nunez, who is the first major signing of this year's international signing period. The A's announced that they agreed to terms with two Venezuelan left-handers, plus Nunez. Anderson Mata, 17, and Jose Torres, 16, will join the A's organization. It's worth noting that this is not the Jose Torres who Keith Law described in a July 2 article for ESPN.